A straightforward malt body supports the distinctive bouquet of Columbus and Falconer’s Flight hops that impart citrus, grapefruit and pine notes characteristic of the West Coast style. 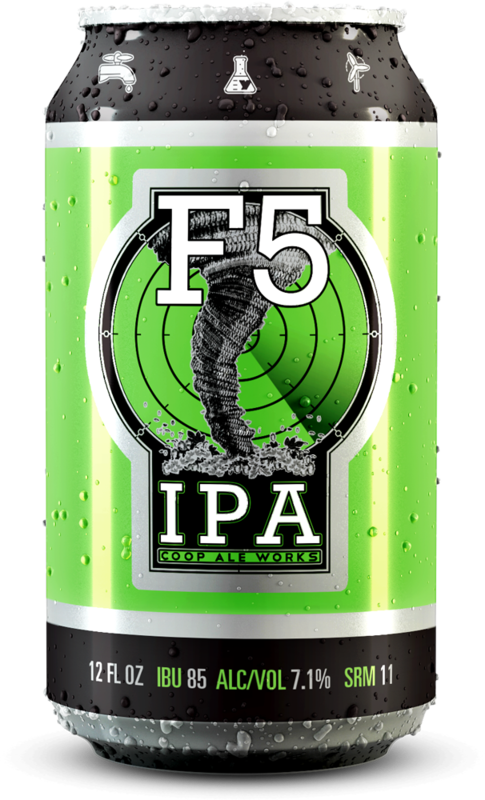 F5 is a belligerent hop reckoning. Big on late-hopped flavor, easy on bitterness, our American Pale Ale has a heaping portion of Columbus and Citra hops added after it leaves the brewhouse. Share this refreshing gas station beer with your nearest companion. 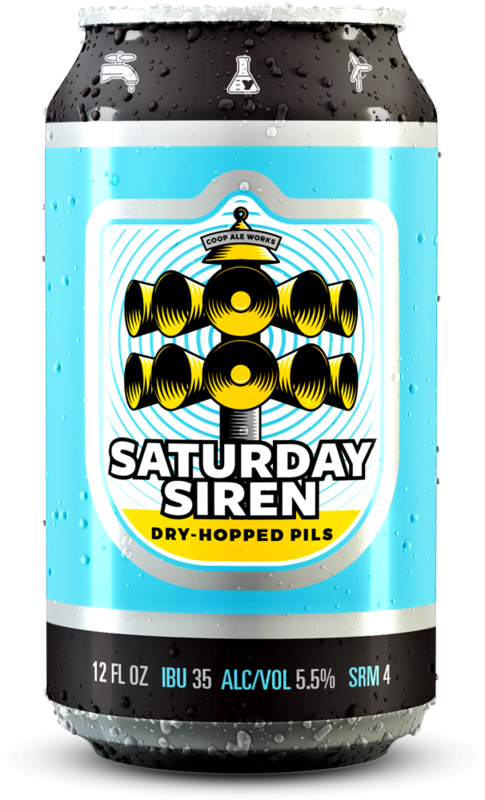 Inspired by weekly siren tests, Saturday Siren is a crisp and refreshing pilsner built for sunny days. Dry hop additions of Idaho 007 and Comet bring new world flavor to this old world style. The lake, the pool and the grill are calling, so pack the cooler and get outside. This Belgian-style dark ale is the culmination of central and western European malts, Noble hops, candy sugar and a traditional Trappist yeast. 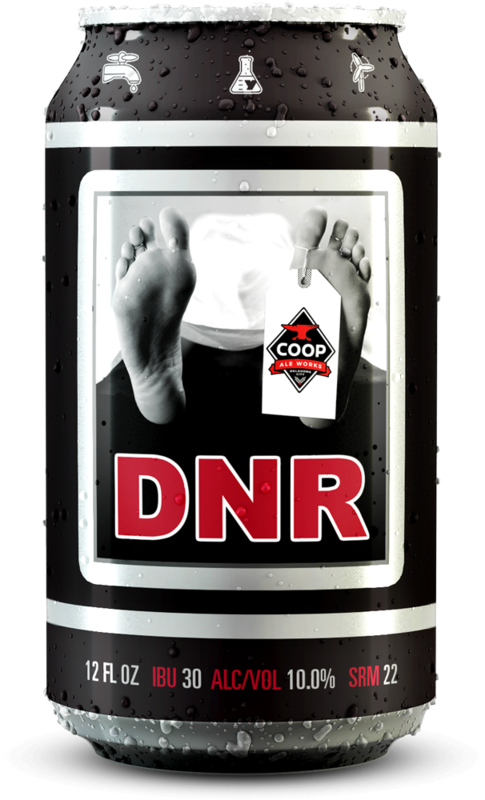 Notes of dried fruit, cinnamon and vanilla make DNR a very complex experience to be enjoyed in moderation. 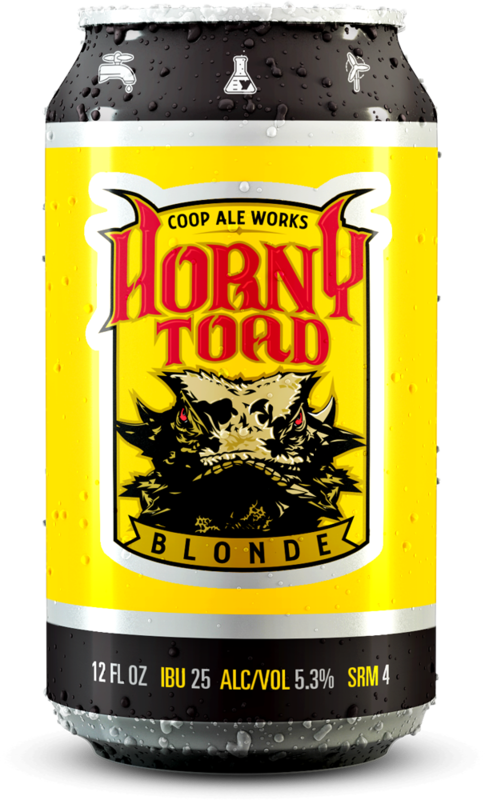 Crisp and clean, Horny Toad is a premium blonde ale with a hint of Noble hop bitterness to balance the two-row and pilsner malt body. 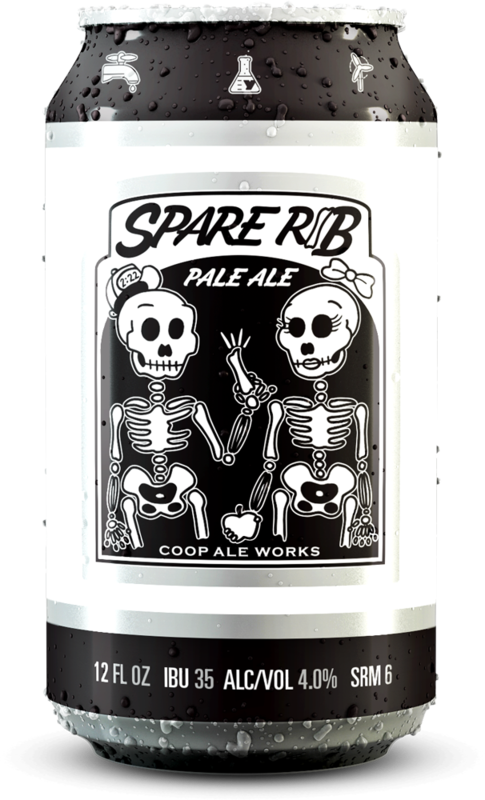 This refreshing libation is a great introduction to craft beer and COOP Ale Works. 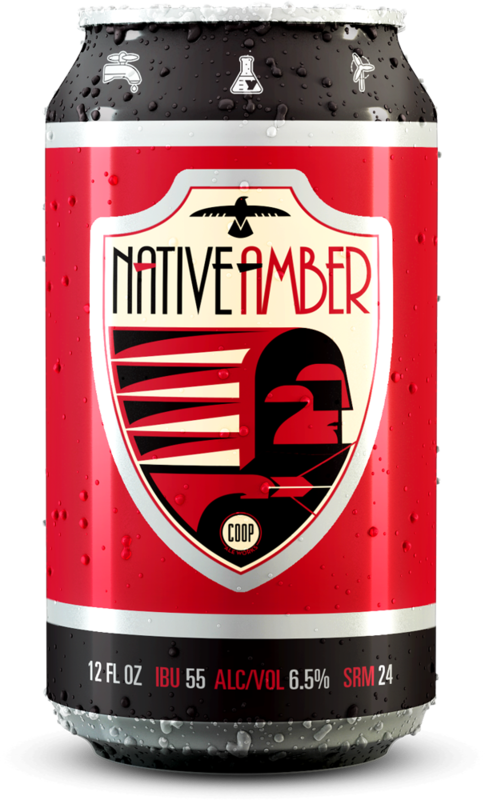 Native Amber is an audacious blend of hops and malt. Caramel and biscuit notes carry the Cascade and Cluster hop additions through to an enjoyably round finish. The malt complexity proves rich and the dry–hopped character is invigorating. 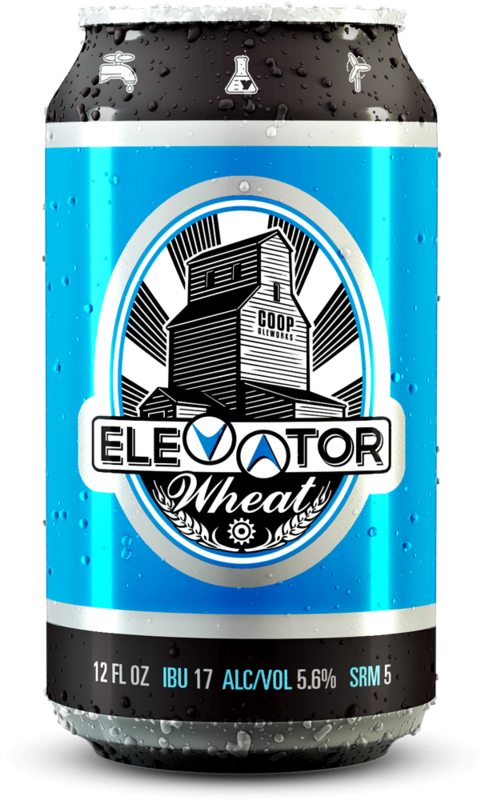 A unique spin on a classic style, this spicy wheat ale starts with a blend of Maris Otter, white wheat and a hint of rye. With a late addition of Cascade hops, the beer is fermented on German wheat yeast. Notes of clove and banana can be found along with noticeable spice from the rye. 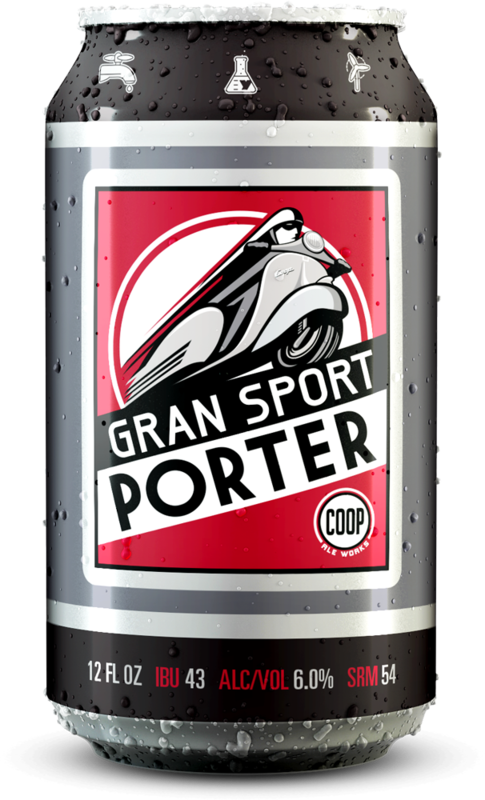 Gran Sport is a robust porter marked by its finesse and distinct malt backbone. Aromatic notes of chocolate and roasted coffee compliment the full–bodied mouthfeel derived from a healthy addition of oat flakes. Dark. Roasty. Malty. Splendid. This Double IPA is infused with a fierce American hop profile and a delicate, bee-crafted orange blossom honey from Northern California. A sting of dankness, floral notes and many a compelling nuance make this spring seasonal delicious. This is no time to buzz off. In the golden age of jet travel, Oklahomans traveled Northeast in glamorous style. Inspired by our state’s colorful aviation history and featuring fruity, juicy hop flavors, this IPA is as hazy as the cabin of a 1960s jetliner. Secure your own beer first before sharing with others. Taking a step away from our namesake, once a year we craft a lager worthy of extra days in the cellar. 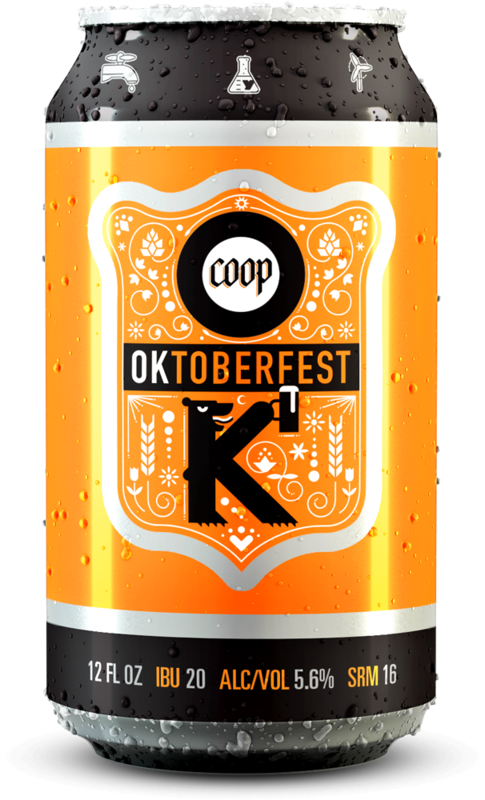 The COOP Oktoberfest combines Munich malt, Bavarian hops and a traditional German yeast, and calls for the celebration of fall’s arrival. It’s time to find a tent, fill your stein, prost, yodel and polka! Our DNR Cask-It Series perpetuates the cult following of an already popular beer by aging it in a variety of barrels. DNR’s sophistication is taken to a new height as it soaks up unique identities of the barrels and creates nuanced flavors and aromas. We hope you enjoy these limited transformations and that you look forward to the experience of each original iteration. Our Territorial Reserve Bourbon Barrel Aged Imperial Stout begins with a wagon full of eight different grains, resulting in a starting gravity of 28° P. It’s then aged for 13 months in bourbon barrels before blending to create a spirit-forward experience. Savor accordingly. Our Rye Wine Ale begins with several extended days in the brewhouse. Following fermentation, the ale is aged in barrels for more than a year. This big, malt-forward beer is well worth the wait. The nose is filled with oak and caramel, leading to a superb mouth feel and intense, warming notes of toffee and toasted coconut. This beer has much to offer the taste buds now, but will surely age quite well. Our Wild Wheat Wine Honey Ale has floral and rustic flavors that begin with a generous foundation of pilsner and wheat malts. 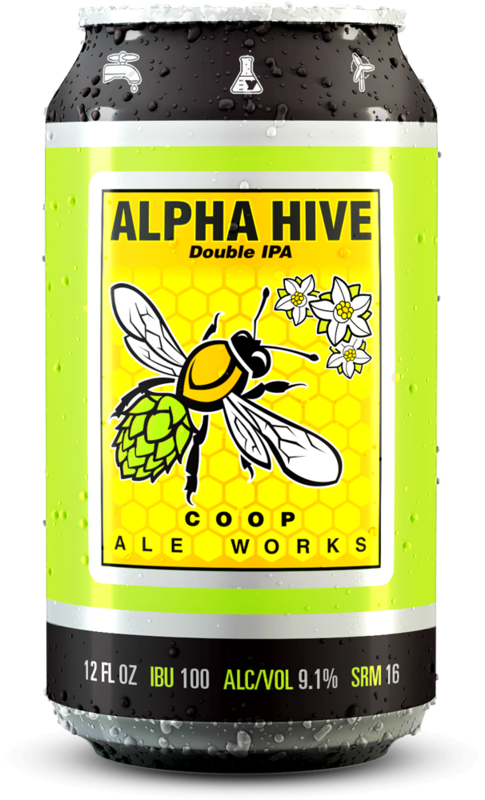 Local clover honey, two wild yeast strains, and 14 months in red wine and bourbon barrels give this distinctive honey ale an earthy backdrop, with notes of sweet tropical fruit and rich tartness. Savor accordingly. Our Barley Wine is a pursuit of this particular beer style in the English tradition. This malt-forward brew is crafted with copious amounts of Maris Otter, and accented with toasted malts. After fermentation, it’s aged in oak barrels where souring bacteria and yeast are introduced. The result is a delicious blend of rich malt character and noticeable tartness. One of Sigmund Freud’s three divisions of the psyche is the id, which represents the instinctual drives of the psychic apparatus. 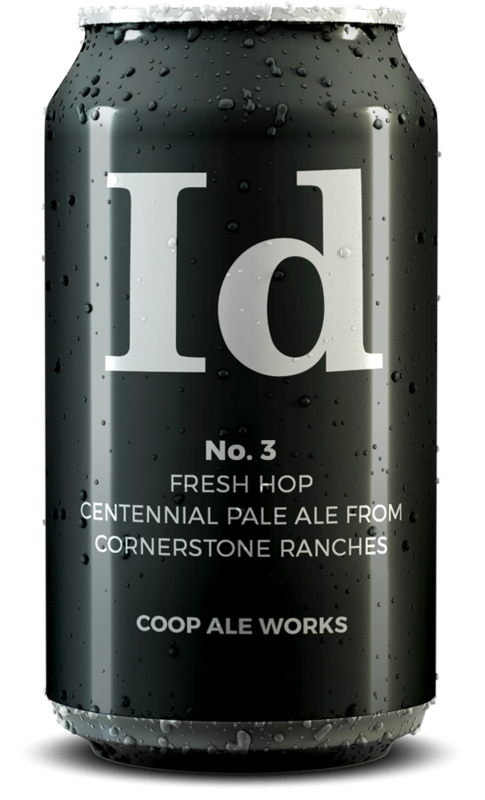 The Id series reflects our brewery’s needs, wants, desires and impulses. Each release is the actualization of styles, ingredients, techniques and flavors sparked by our present state of mind. These beers are intended to be limited, one-time releases, and tomorrow’s spontaneity will be our impetus. The first in this series is a brett ale with persimmons aged in Chardonnay barrels. 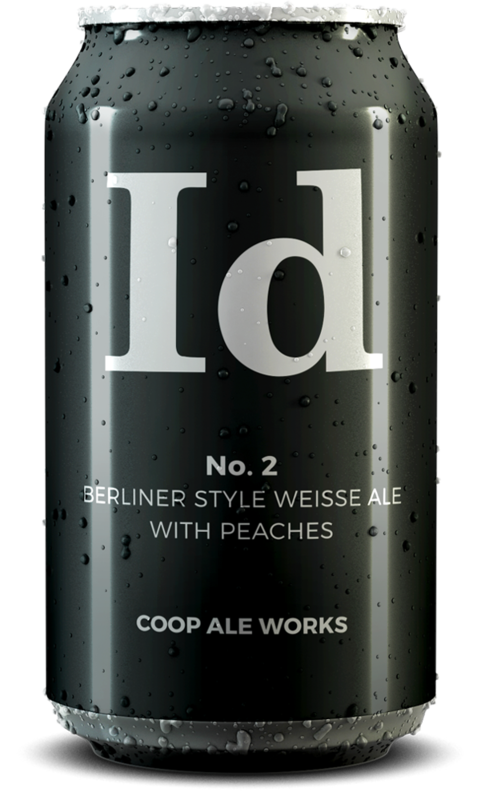 Our Peach Berliner Weisse has been a staff and fan favorite over the years, so the Id series was the perfect opportunity for us to release a larger batch. This fruity, tart ale is perfect for a day by the pool or at the lake. This pale ale features fresh Centennial hops from Cornerstone Ranches in Yakima Valley, Washington. Designed as an homage to the farmhouse ales of Belgian’s past, this oak aged sour beer is a blend of two barrel ecosystems, resulting in a balance of sour and funk. Dry-hopped with Kent Golding and Mittelfruh, this oak aged sour farmhouse ale features notes of hay, green tea and citrus. This Brut India Pale Ale is hopped with Mosaic, Citra, Idaho 7 and Hallertau Blanc. An enzyme is added during fermentation to further process starches and create a dry, brut-like effect. This is some bubbly for the beer lover, perfect for toasting your special occasions. Id No. 6 is one for a good cause in collaboration with Sierra Nevada Brewing. This Centennial and Cascade India Pale Ale was made in support of those impacted by the Camp Fire in Butte County in late 2018. Craft breweries around the country took part in this collaboration fundraising project, and 100% of all sales of this beer were donated to the Sierra Nevada Camp Fire Relief Fund. Thanks to our community, we were able to raise more than $6,000 for those impacted by these wild fires. © 2019 COOP Ale Works All rights reserved. Live music in the taproom every Thursday! May 2 featuring Martha Odom. We’re bringing live music to the #COOPTaproom on Thursday nights! We’re open every Thursday from 4-8 p.m., and live music from local artists will kick off around 6. Come out on May 2 to hear from Martha Odom. May the Fourth be with you in the COOP taproom. Join us for Star Wars trivia and costume contest. What better way to celebrate May the Fourth than with some Star Wars trivia? Come out to the taproom on May the Fourth for some Star Wars trivia and costume contest. The taproom opens at noon and trivia will kick off at 2 p.m. for teams of up to 6 people. Prizes will be awarded for first, second and third place, and for the best dressed team. Phill Me Up Cheesesteaks will be here all day. 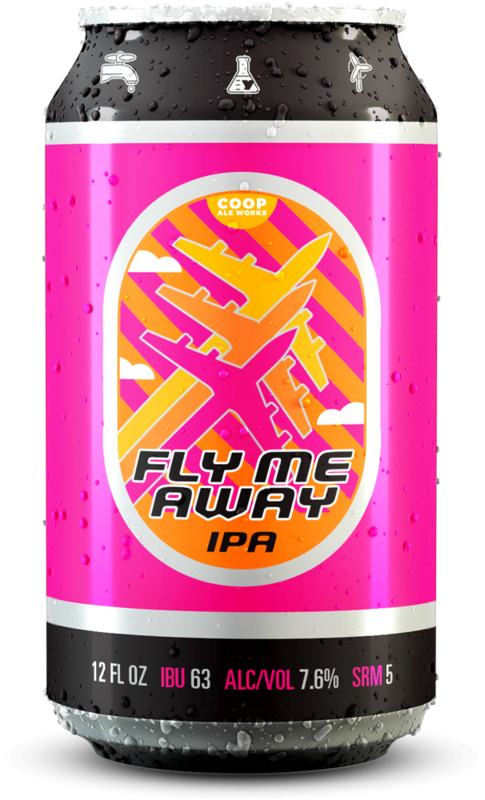 This is also the first day you can get our summer seasonal Fly Me Away IPA in the taproom. Bet, win and fly away at our Fly Me Away IPA Summer Seasonal Release and Derby party on The Pump patio. Bet, win and fly away at our Fly Me Away IPA Summer Seasonal Release and Derby party on The Pump patio. We’ll be out from 3-6 p.m. on May 4 watching the races and having our first taste of our summer seasonal Fly Me Away IPA, a juicy, fruity IPA perfect for quenching your summer thirst. And what’s a Derby party without some betting? With your entry, you’ll receive a ticket to bet on the horse of your choice. After the big race is done, we’ll draw out of the winning horse’s bucket and give away a trip to the Great American Beer Festival in Denver Oct. 3-5. * Additional entries will be available for purchase. Derby attire is encouraged and prizes will be awarded for best dressed. Food and specialty cocktails will be available for purchase from The Pump. Tickets are $20 and all proceeds benefit our future neighbors at the Uptown 23rd District. Tickets are available at coopderby.eventbrite.com and at the Tower Theatre box office. *Must be 21+ to win. Prize package is non-transferable. Transportation and hotel accommodations must be made by Aug. 1, 2019. Join us for a night of bowling and beer as we release our summer seasonal Fly Me Away IPA. Join us May 6 at Dust Bowl Lanes & Lounge for a night of bowling and beer as we release our summer seasonal, Fly Me Away IPA. Get a taste of this fruity, juicy IPA while teams of 6 compete for best team score, individual score, fastest bowl and more. Team registrations are $300 per team and include two Fly Me Away IPAs per guest, food and two hours of bowling. Don’t have a team of 6? Join the “Potluck Team” at $50 per player for up to 6 participants. Spectator tickets are available at $25 per person and include two Fly Me Away IPAs, food and access to the arcade area. All proceeds benefit the Community Food Bank of Eastern Oklahoma. Get your tickets now at FMAbowling.eventbrite.com. Live music in the taproom every Thursday! May 9 featuring Justin Pruitt. Come out on May 9 to hear from Justin Pruitt. Live music in the taproom every Thursday! May 16 featuring Andy Adams. Come out on May 16 to hear from Andy Adams. Live music in the taproom every Thursday! May 23 featuring Eric Dunkin. Come out on May 23 to hear from Eric Dunkin. Beer is one of the world’s oldest prepared beverages. The top state for beer consumption per capita is North Dakota. Beer is the name of a relatively small lunar impact crater on the moon. Beer soup was a common breakfast in medieval Europe. In 1986, a beer-drinking goat was elected mayor of Lajitas, Texas. Beer is the third most popular drink on Earth, after water and tea. The first beer cans were produced in 1935. John Lubbock, an 18th-century English biologist, studied the behavior of beer on drunken ants. George Washington had his own brewhouse on the grounds of Mount Vernon. A cloud near the constellation Aquila contains enough ethyl alcohol to fill 400 trillion trillion pints of beer.